We sat down with talented performer Daniel Buckley as he prepared for a performance of Loserville at the Garrick Theatre. Buckley originated the role of Marvin in the pop musical when it premiered at the West Yorkshire Playhouse before making his West End debut in the show’s transfer to London. He recently won a West End Frame Award for Funniest Performance in a West End Show for his performance in Loserville, beating stiff competition including Rob Brydon, Jodie Prenger, and Gina Beck. He graduated from Mountview Academy of Theatre Arts in 2011, and his previous credits include the UK tours of Spring Awakening and Lord of the Flies, as well as Fresher the Musical at the Edinburgh Fringe Festival. Loserville is set in a small town in America in 1971 and follows a group of friends who are working to invent the internet despite the dastardly plans of the town’s jock Eddie. Marvin is one of the lovable “losers” in this band of misfits who end up changing the world with their ideas. With new music by Elliot Davis and Busted’s James Bourne, this new British musical has been delighting London audiences since it opened in October. It has also recently been announced that Buckley has landed a role in the cast of The Book of Mormon, easily the most-anticipated show opening in 2013. He will be playing Stand-by – Elder Cunningham after winning the part in a grueling audition process. He will be covering the role for Jared Gertner, who is currently playing Elder Cunningham in the Los Angeles production after serving as a Stand-by on Broadway. 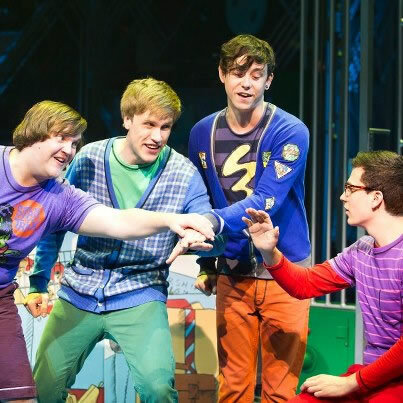 There’s still time to catch Loserville at the Garrick Theatre before it closes on 5 January, 2013 – don’t miss this brand new British musical starring Daniel as one of the hilarious leads! The Book of Mormon takes up residence at the Prince of Wales Theatre with previews beginning on 25 February 2013 before an official opening date of 21 March. Daniel will be covering the role of Elder Cunningham.